I guess I’m supposed to tell you all about my trip to Charleston for the SAVEUR blog awards, right? You probably want to hear all about the other finalists, the food and wine, or what it was like to meet Deb in real life. 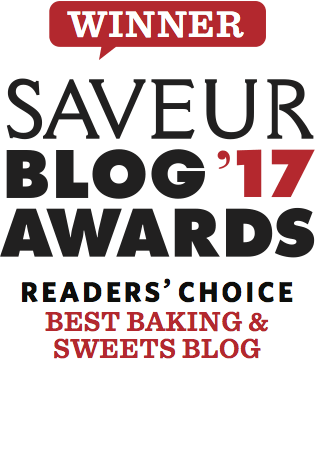 Maybe you’re curious if Wood and Spoon blog brought home a win in the “Best Baking and Sweets” category (hint: we did! ), or if I ever figured out how to pronounce the word “Saveur.” Though I should probably be carving out space to share about this past week and the wonderful new friends that were made, to be honest, I haven’t yet figured out how to sum it all up. So for now, let me dive into the beauty that is this brown sugar cheesecake and we can hash out the other details later. 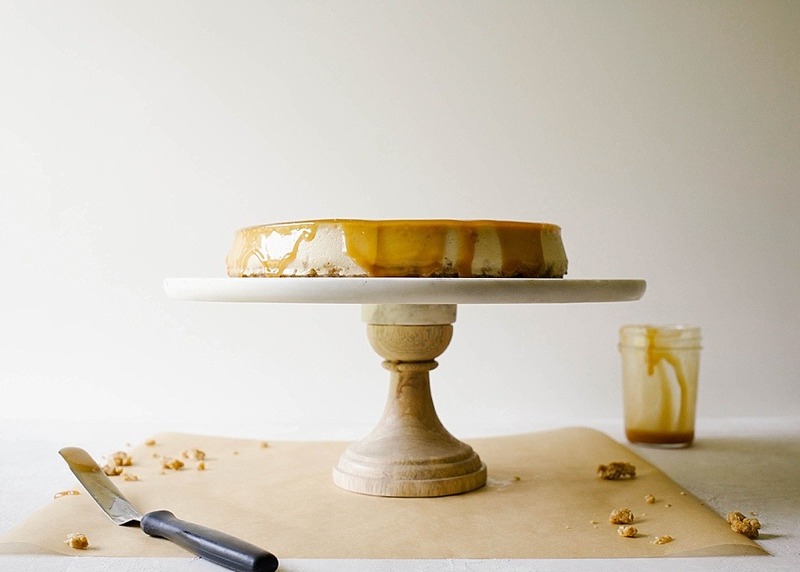 Before we begin, let me make one thing clear: I have dreams about this brown sugar cheesecake. A perfect combination of sweet and salty, this cake is a dessert that fulfills every taste and texture desire of my heart. For starters, I think about the tangy filling, folding over itself in silky clouds inside the bowl of my mixer. The scent of the oatmeal cookie crust, rich with butter, molasses, and cinnamon, wafts to the scene, momentarily stealing my every affection. 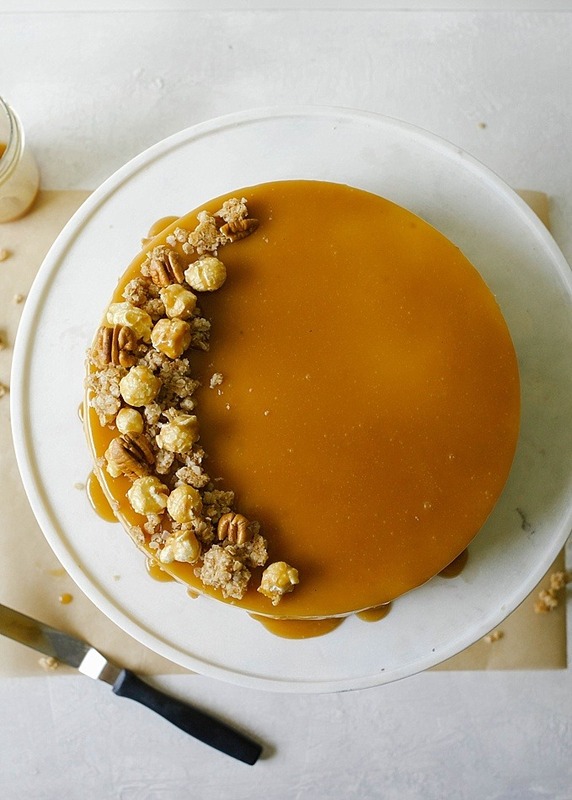 But it’s the butterscotch sauce, thick and drippy, with caramel flavors and a not-so-subtle hint of salt, that oozes in and completes the most perfect bite. Each element of this cake enhances the flavors of its counterparts and it so tantalizes my tastebuds that I could almost break out into song. Without question, this brown sugar cheesecake is the one you won’t get over. Like the other cheesecakes on this site, we start by preparing the crust. Brown sugar, flour, oats, cinnamon, and salt are brought together with the addition of melted butter. Stir it all together and pat out the mixture into the bottom of a springform pan. While it bakes in the oven, we can prepare the filling for the cake. Cream cheese is beat on medium speed just until all of the clumps have been smoothed out. Brown sugar is added next, followed by eggs, heavy cream, and vanilla. The goal here is to incorporate each element evenly without overbeating the mixture as this can cause air bubbles and cracks in the cake once baked. Just beat in each addition until well combined, and be sure to scrape the sides of the bowl regularly. Now everyone has their own special way to make a cheesecake, but there’s a few things that are almost universal to the process. First, you don’t want the cake to undergo drastic temperature changes during the baking process. To address this need, I prefer to put my cake pan in a waterbath, a pan full of boiling water that reaches about halfway up the sides of the cake. I also try to cool the cake down slowly so as not to cause cracks or shrinkage along the edges of the pan. Second, it’s important to not over-bake your cheesecake. To test your cake for doneness, look for edges that appear to be slightly set and a center that is wiggly under the surface of the cake. I turn the oven off once the inner half of the cake is only slightly jiggly upon shaking the pan. 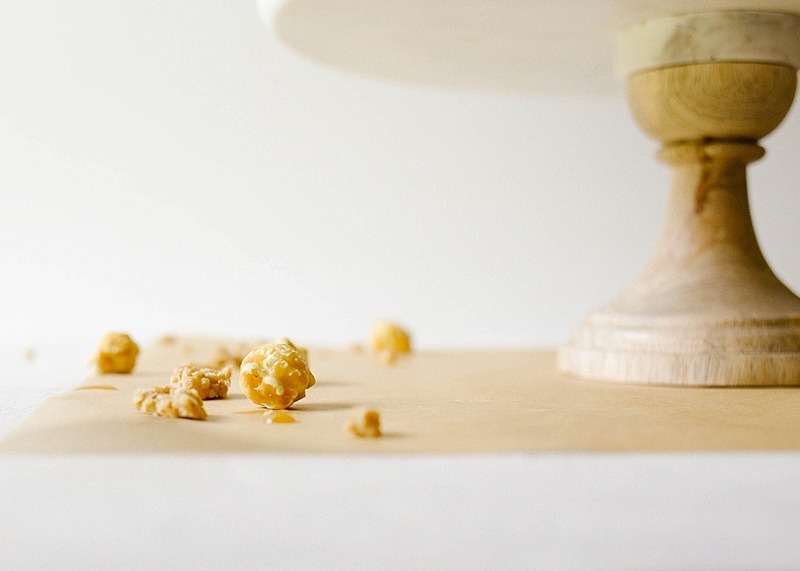 Unlike flour cakes, cheesecakes don’t adhere to the toothpick test, so don’t bother sticking your hand in there, okay? Third, we want a crust that is baked, not soggy. If you opt to use the waterbath, be sure to wrap the outside of your pan in aluminum foil to ensure that no water seeps in to muck up your crust. I go a bit overboard and wrap my pan with three large layers of heavy duty foil, but I swear to you that extra effort is worth it. 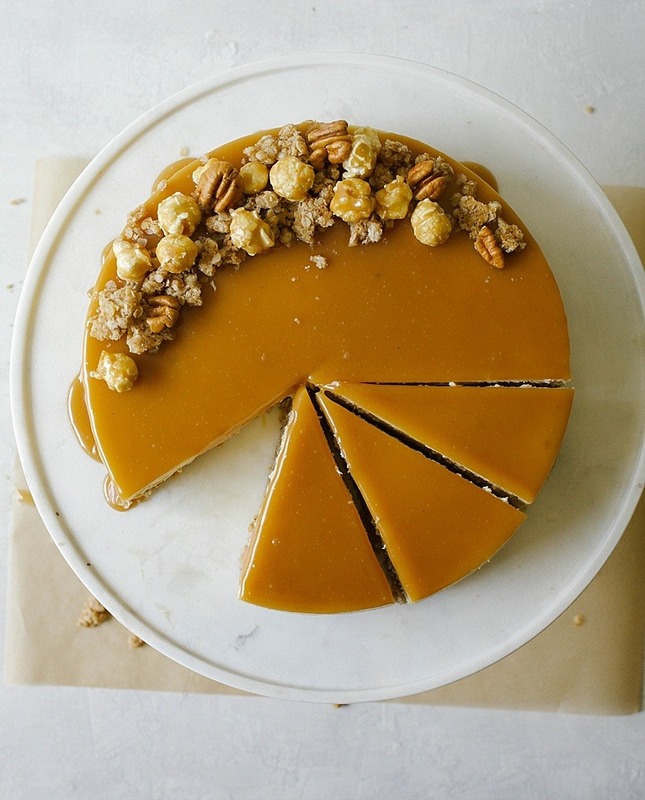 The butterscotch is a can’t miss addition to this cake. Sure, the cheesecake is delicious on its own, but why pass up the opportunity to douse anything with a rich, decadent sauce like butterscotch? You could opt for store-bought, but let me encourage you, from the bottom of my heart, to consider making my favorite butterscotch sauce. Deb (yes, the one I met this past week) has the easiest, 5-ingredient sauce that you cannot screw up. I promise. If you prefer, Bobby Flay’s caramel sauce would do the trick here as well. I’ve got a lot of joy and fun memories from this past week that I’m dying to share with you, but for now, I hope you’ll accept this brown sugar cheesecake. It’s sweet, salty, and entirely delicious- a dessert worth sharing with the best blog readers and friends the world has to offer. 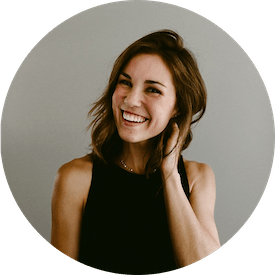 Thank you for continuing to support the Wood and Spoon blog. You guys rock. The brown sugar cheesecake boasts a sweet and salty oatmeal crust and a gooey butterscotch sauce. Prepare a 9″ springform pan by wrapping it in sheets of aluminum foil. I use 3 layers of extra wide, heavy duty foil wrapped to the top lip of the pan. Spray the inside walls and bottom of the pan with cooking spray. Stir together the dry ingredients until combined. Add the melted butter and stir just until combined. Gently pat out your mixture evenly into the bottom of the pan. Bake in the preheated oven for 10 minutes. Begin boiling some water in a kettle or saucepan for your water bath. Beat cream cheese in the bowl of a stand mixer at medium speed (I use 4 on my Kitchen Aid Mixer) for 2 minutes to remove all clumps. Do not overbeat, but scrape the sides of the bowl as needed. If many clumps remain, ensure that your cream cheese has softened to room temp. Add the sugar and beat on medium for an additional 1 minute. Add eggs, one at a time, and beat to combine an additional 1 minute. Scrape the sides of the bowl and then add the heavy cream, and vanilla. Beat to combine. Strain the cheesecake batter through a mesh strainer (if desired) into a reserved bowl. Pour the batter on top of the crust. Gently rap the pan on the counter to help any air bubbles escape. Place your springform pan into a slightly larger baking dish/pan and fill the larger pan with the boiling water you prepared for the water bath until the water reaches about halfway up the sides of the springform pan. Carefully place both pans in the preheated oven and bake for 1 hour. After an hour of baking, the edges and top of the cheesecake should be set but still slightly jiggle in the center. Turn the oven off and allow the cheesecake to bake for an additional 30 minutes in the oven. Prop the door of the oven open slightly with a wooden spoon and continue to cool the cheesecake for another 30 minutes in the cooling oven. Discard the water bath, remove the foil and then place the cheesecake in the fridge to chill for several hours or overnight. The cheesecake can be stored in the fridge for several days. Serve with butterscotch sauce (see notes) or homemade caramel. I wrap my springform pan with three layers of heavy duty aluminum foil. This is to protect your crust from any water leakage of your springform pan. Many pans will claim to be waterproof but your crust will get soggy and inedible if water leakage happens. Don’t take any chances! I use a 11″ round cake pan for my water bath but you can use any oven-safe dish that you have. Once of my readers used a roasting pan and that works just fine! The cooling process seems lengthy and unnecessary, but it helps to prevent drastic temperature changes that can cause structural issues with your cake. I love the butterscotch sauce from Smitten Kitchen and Bobby Flay’s salted caramel sauce. See the post above for the link to these recipes. Made this tonight with a little alteration in the crust … I crushed Trader Joe’s gluten free ginger chunk cookies, added a little brown sugar, cinnamon and about half of the melted butter then followed the rest of the recipe as written. Such a simple swap so it keeps my tummy happy, and my family doesn’t notice at all. Thanks so much for an easy, yummy treat! what a great idea! I haven’t tried those but they sound wonderful! Made this recipe today and it came out great! I did not have a large cake pan or roasting pan for a water bath which made me a little nervous but I used a rimmed baking sheet instead and filled it up as much as I could with the boiling water which amounted to 3/4 – 1 inch of water total and the cheesecake didn’t crack! Hooray!!! Oh, I hope you loved it as much as I do! I’ve made this twice so far, and I gotta say, it’s a huge hit! Thanks for a phenomenal recipe that makes me feel like a rockstar! oh hooray!! this makes me so happy. thank you for sharing, nikki! Well you’ve convinced me. My grandma used to make some amazing oatmeal cookies. I think she would really like this. Now I want to make it so I can think of her. And eat cheesecake. Thank you! I’ll definitely check it out! Andrea, I have researched high and low to figure this out and I can’t come up with an explanation. This isn’t a terribly thick cheesecake, but it is certainly taller than 1″. Mine is usually about 2″ thick? I’m going to keep pondering and will let you know if I come up with anything. I sure hope it tasted AMAZING though. Hi there! 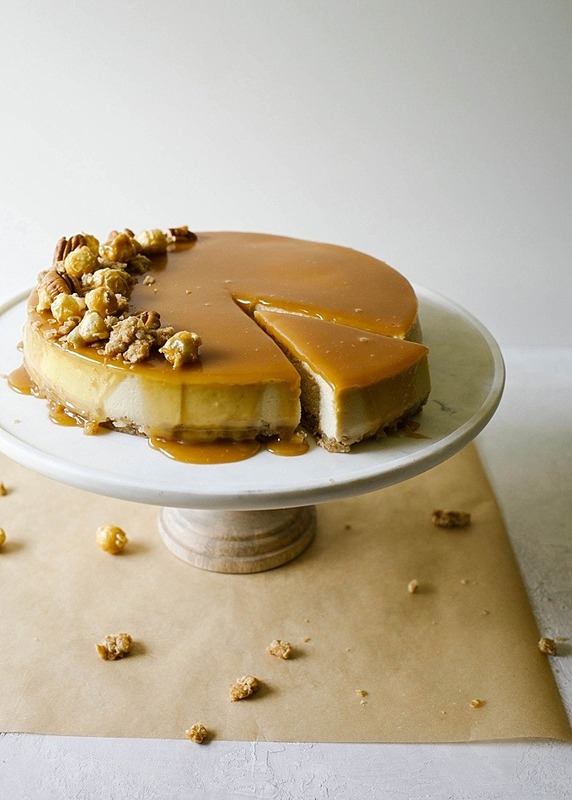 I’m planning to make this gorgeous-looking recipe, but I have a question about the butterscotch sauce — what temperature should the sauce be when you pour it over the cheesecake? 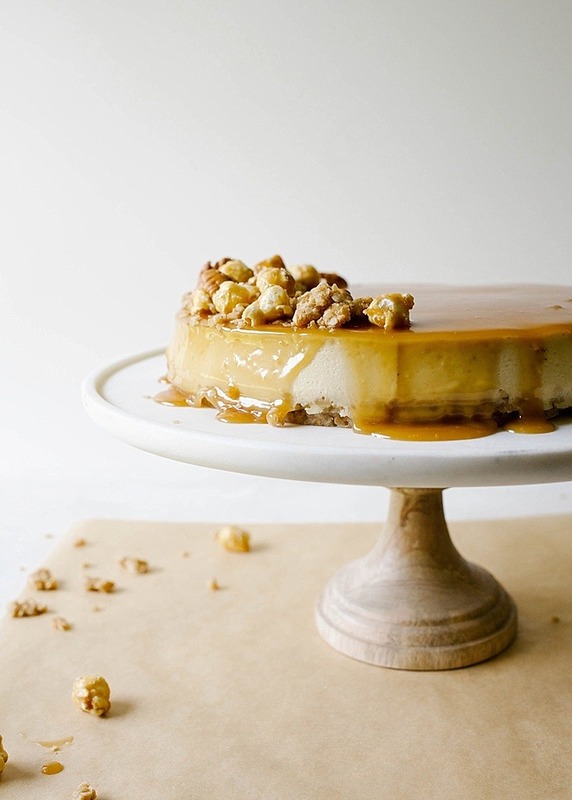 Obviously it seems like hot butterscotch sauce would risk melting the cold cheesecake, but cold butterscotch sauce seems like it won’t be pourable. Any tips would be much appreciated! 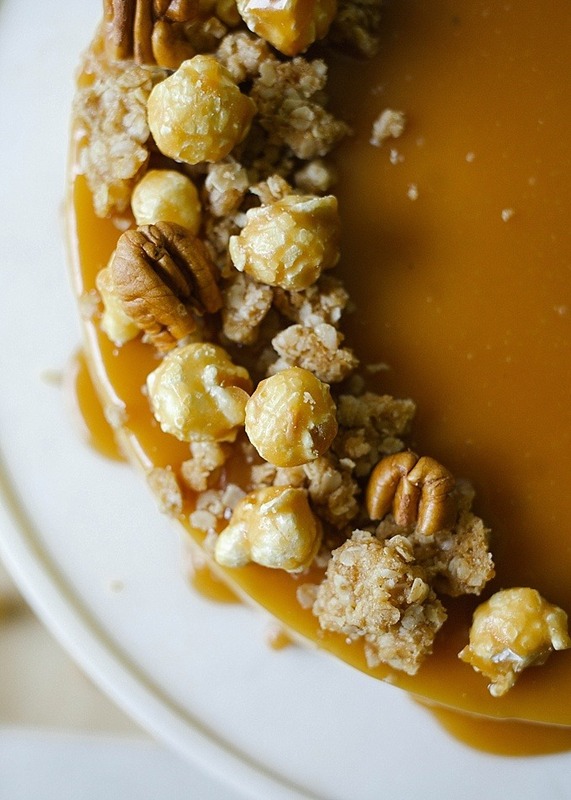 What’s sprinkled on top of the butterscotch sauce? I’m hoping to make this next weekend for my brother’s 35th birthday party! I made a little extra crust and baked it in the oven on a cookie sheet. I sprinkled that, plus a little caramel corn and toasted pecans on top! I can’t wait to hear how it goes! I will most certainly share!!!!!! Someday we will share stories IRL. ha! I’m so tickled! well enjoy poking around the site. I love making new friends here! Congratulations Kate! So well deserved! And this cheesecake-what a beauty-my mouth is watering!